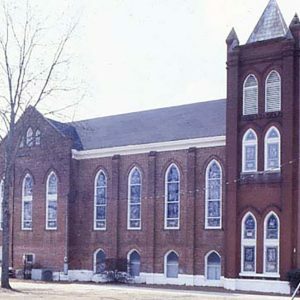 This church was founded in 1873 with Rev. Dave Christie as its first pastor. In 1877 trustees Emily A. Williams, Richard Howard, and Irwin Mintz purchased a small lot here, on what was then Market Street. They soon built a frame church, which stood for almost 30 years. Additional acreage purchased in 1909 allowed the congregation to build an addition and parsonage. This Gothic Revival church was designed by Miller F. Whittaker, one of the state’s first black architects and a member of this congregation. The cornerstone was laid in 1919 and the church was completed about 1925.